A few domestic airlines serve Costa Rica with scheduled flights. The well known premium tourist airline, NatureAir, ceased operations in January 2018 and a pack of newcomers propose to pick up the slack for the 2019 high travel season – Green Airways, Aerobell, SkyWay, and TAC all have, or promise to have, flights to the most popular vacation destinations. SANSA has been in service since 1978 as part of the TACA Airlines regional airline system. It is owned by the national carrier Avianca Costa Rica (formerly and aka LACSA). SANSA and Aerobell both use versions of the 14 passenger single engine Cessna 208 Grand Caravan. SkyWay will fly 19 passenger twin engine LETs L410 UVP E20. Most SANSA flights are in 14 passenger Cessna 208-B Grand Caravans (left), but they have a variety of aircraft available to accommodate from 10-46 passengers. Aerobell uses Grand Caravans for scheduled flights plus three helicopters and a variety of small planes available for charter. Aerobell has limited initial operations to seven of the most touristic destinations – Tortuguero, Tamarindo, Tambor, Quepos, Drake Bay, La Fortuna (Arenal) and Puerto Jimenez. They also seem poised to adopt NatureAir’s tourist first model responding quickly to e-mails or phone calls in English (or other languages). Generally flights range from $40-$180 each way (there may be additional fees). Both airlines also offer charter services to all of the airports they normally serve plus others lacking scheduled flights. The “national” airline, SANSA is consistently a couple dollars cheaper, but probably not enough to influence a choice between the two. Depending on which airline your domestic flight is on it will depart from one of San José’s two airports. Aerobell & TAG fly out of Tobias Bolaños airport north of Pavas. SANSA, Green and SkyWay fly out of a new domestic terminal at Juan Santamaría (SJO) International Airport south of Alajuela. SJO is more convenient if you’re connecting with a international carrier but we like some things at Tobias Bolaños. Bigger isn’t necessarily better. Tobias Bolaños is tiny – one room and you breeze through ticketing, check in and security. Last time we landed at SJO on a regional flight from Panama the 10 passengers from our plane were stuck in immigration for a couple of hours since jumbo jets carrying 250 passengers each from Miami, Houston, L.A. and New York had arrived a few minutes earlier. Check your airports carefully. A taxi ride between the two airports costs around $20 and takes about 20 minutes without traffic which could stretch it to well over an hour some times of day. All of Costa Rica’s domestic flights require payment in full to reserve a seat. There are no refunds and most flights are sold out. If you miss a flight you’ll probably have to find your own alternative transportation (rental car, public bus, or shuttle). If a flight is cancelled due to weather, mechanical problems, or regulatory issues passengers will often be transported by shuttle van instead. If ground transportation or a later flight cannot be arranged passengers will be offered credit towards future flights but most tourists won’t be around to use the credit. In the past the domestic luggage restrictions were pretty straightforward. Each passenger was limited to 25 lbs total…no sneaking on a personal item, no wardrobe sized carry-on. Now there’s a spectrum of rules depending on which airline you fly and how much you spend on your ticket. The basic assumption that you’ll need a significantly trimmed down packing list compared to the allowances for an international flight is still valid but you may be able to buy more bag space. All passengers are also required to step on a scale before boarding the plane. Accurate weights are required in order to safely balance the payload and to ensure the plane has enough power to take off and land. You will not be excused. If the total payload exceeds safe limits all of the airlines reserve the right to leave any or all of the luggage behind. It will be transported by van or on a later flight and will catch up with you in a day or two. Unfortunately our go to local airline for reliability and high quality service, NatureAir, went out of business. There’s not enough data yet to make a judgement on the other four airlines. They are all trying to ramp up during peak travel season starting in December 2018 which could prove a challenging time to be getting a new business off the ground. None of them will be fully operational on all their planned routes before mid to late 2019. Once there’s some info and we’ve taken a flight or two we’ll update our personal recommendation but for now all we can say is cross your fingers and if things go sideways remember it’s all Pura Vida! We have worked with SANSA as a backup for over a decade and flown them a few times. As long as nothing unexpected comes up SANSA is great. However if a situation arises that requires communication or consideration their quality score plummets. Customer service is not their strong suit. Started in 1988 with small plane and helicopter charters they were first to jump into the gap opened by NatureAir’s demise. Aerobell has a good head start on the competition successfully operating flights to their core destinations since July 2018. They have the most restrictive weight limit charging $2 per pound for anything over 20lbs on their economy tickets. Visit their website or call (560) 4000-2030. In late August a third carrier, SkyWay, began taking reservations for flights commencing late November to the Osa, La Fortuna, Quepos and Tamarindo. They also list service to Bocas del Toro Panama but the reservations systems showed “no flights available” for each date we checked through April 2019…you may have to call. Green Airways will be the scheduled carrier arm of Carmon Air a longtime charter operator. They plan to offer daily flights from SJO to Nosara, Tambor and Quepos (Manuel Antonio) by the end of November and additional flights to Puerto Jimenez (Osa Peninsula), Golfito, Liberia (LIR international airport) and Tamarindo for high season 2019. Definitely the winner in the “best website” category if that counts for anything. Despite their ambitious November 2018 announcement by January 2019 Nosara and Quepos have been deleted, none of the other planned flights have been added and Tambor is the sole destination appearing the Green reservation calendar. TAC Airlines Costa Rica will be the local branch of TAGuatemala which has provided scheduled domestic flight service in that country for fifty years. 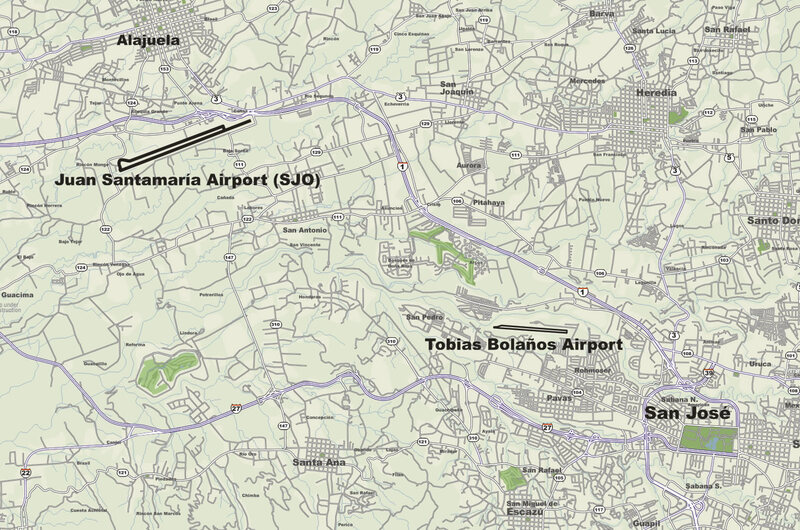 They look to serve the same destinations as Green Airways but will operate from Tobias Bolaños Airport in Pavas instead of Juan Santamaría in Alajuela. Update January 21, 2019 – One year after shutting down Nature Air has made a financial settlement with Lloyd’s of London and announced that they are accepting offers of financing and job applications for all positions in hopes of eventually resuming operations. No new information was provided about refunds for flights canceled in 2018.